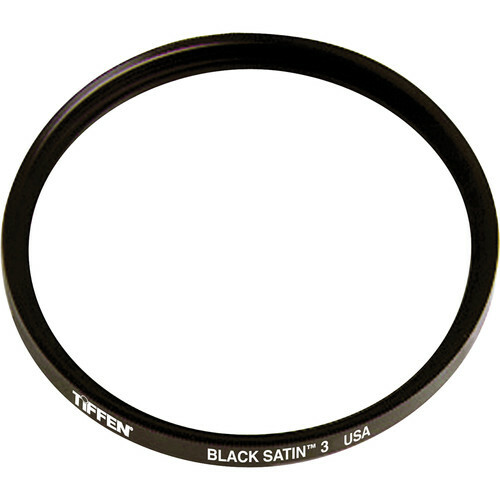 The Tiffen 58mm Black Satin 3 Filter helps to reduce the overall contrast of an image and better control the highlights within a scene. In addition to rendering highlights with a grittier, more grainy appearance, this filter also helps to subtly soften facial blemishes and wrinkles for a natural, refined look. The 3 density provides more contrast and highlight reduction than the 2, while still producing a soft, yet natural appearance. This filter is constructed from Water White glass and is made using ColorCore technology, a process that involves laminating the filter substrate between 2 pieces of optical glass, grinding flat to a tolerance of 1/10,000th of an inch, and mounting to precision metal rings. Offers greater control over highlights, reduces overall contrast, and produces a grittier, grainier appearance in highlight regions. Smoothes facial blemishes, wrinkles, and other textures for a natural look. Maintains clear focus and realizes a more filmic look than purely digital capture can otherwise record. Ideally suited for use with modern lenses and digital image sensors. Water White optical glass maintains high optical clarity.